The preferred de-excitation pathway of low-energy excited nuclear states is internal conversion (IC). Instead of de-exciting to the ground state via emission of a gamma, they couple to electronic states of similar energy. Their excitation energy is transferred to the electron, which typically leaves the atom and carries away the excess energy. Such a process is common for nuclear states up to 1 MeV, and its probability generally increases with decreasing excitation energy. For the U-235 isomer at 70 eV, IC is virtually the only de-excitation pathway. The nucleus does not only couple to electronic states of the atom itself, but also the the environment: the IC rate depends on the electronic states in the neighborhood (charge state, work function of the material the atom is placed on, molecule/chemisty, …). Indeed, for U-235, a mild dependence of the isomer half-life on the nature of the host material has been observed. The nuclear optical clock, envisioned by nuClock researchers, relies on optical excitation and optical detection of the isomeric transition. As such, IC is thought of as a competing, undesired process that needs to be suppressed. The IC rate (or equivalently, the half-life of the isomer) is expected to depend dramatically on the charge state of the Th-229 atom or ion. For the neutral thorium atom, the first ionization energy is smaller than the isomer energy: the isomer may pass its energy to a valence electron quickly, which then leaves the atom. This process was used for the first direct detection of the isomer in the earlier work of the LMU group. For atoms in higher charge states (more specifically, with an ionization energy way larger than the isomer energy), the IC channel should be heavily suppressed, and the lifetime of the isomer is expected to reach its radiative limitation of about 1000 s.
The LMU group set out to measure the isomer half-life in neutral Th-299. Using much of the technology available from their earlier work, they accumulate about 400 ions of Th2+ or Th3+ in an ion trap (about 2% of them in the isomeric state), and gently slam this bunch of ions onto an MCP detector. The ionic impact (neutralization of the ions on the detector surface) produces a rather large signal, which decays in a fraction of a microsecond. Afterwards, the isomeric nuclei are free to de-excite via coupling to the electrons of the Th atom (or of the detector surface). The electrons are ejected with a small kinetic energy (e.g. the isomer energy minus the work function of the material) and generate a signal on the MCP. By summing over many 10’000 bunches, the signal of the IC electrons forms a very beautiful exponential decay with a half-life of 7(1) µs, corresponding to a lifetime of about 10 µs. Such an exponential decay was observed only for Th-229, but not for any other Th or U isotope. The half-life of the isomer matches theoretical expectations very well (predicted reduction of the 1000-seconds radiative half-life by a factor of 10^9). The half-life of other charge states (e.g. Th+ or Th3+) is of interest as well, but cannot be measured with the present technique. The layout of the experiment, however, allows to deduce certain bounds on these values: < 10 ms for Th+, and > many minutes for Th2+ and Th3+. It is still unclear how the surprisingly short half-life in Th+ is related to the isomer energy. Learning that the isomer half-life is at the expected order of magnitude is reassuring for the international research community working towards the nuclear clock. Although a more precise measurement of the half-life would not aid the development of the nuclear clock much, it would add to similar work on the isomer in U-235. So far, the LMU group worked with only one surface material. It would be insightful to replace the present nickel alloy by a range of other materials, e.g. metals with different work functions, or insulators. Such a measurement would explain whether the IC is dominated by the Th atom’s electronic shell, or by the surface around it. Ultimately, researchers at LMU plan to perform the experiment in free space (without any surface), e.g. by neutralizing the ion bunch with a beam of cesium atoms. The lifetime of the Th-229 isomer was measured in the neutral state. Bunches of (a) Th2+ and (b) Th3+ ions were placed on an MCP surface, where they neutralize and give rise to a large signal peak, clearly visible at about 82 µs (figure a) and 68 µs (figure b). For the Th-230 isotope (blue curves), the signal drops to zero within less than a µs. For Th-229 (red curves), however, an exponential tail is clearly visible. This additional signal is interpreted unambiguously as the de-excitation of the isomer. An exponential fit to the data gives a half-life of 7(1) µs. The findings of this experiment have been published today with Phys. Rev. Lett. (even as an Editors’ Suggestion!) and can be found here. The corresponding LMU press releases are available in German and in English. Building an optical clock based on the Th-229 nuclear transition is the ultimate goal of the nuClock project. We like to claim that such a nuclear clock will be less sensitive to perturbations (because the nucleus is so much smaller than the orbits of valence electrons), offer a supreme quality factor (because the transition energy is so large, and the lifetime of the isomer is so long), and outperform existing clocks in flat-out all respects (well, we become a little bit emotional sometimes). We also like to claim that the nuclear clock will be very robust in operation, ideally suited for geodesy and space applications. In terms of robustness, there is now an experiment that sets a new standard. The PTB group of Christian Lisdat built, operated, and characterized a transportable optical clock (TOC, as compared to SOC (space optical clock) and NOC (nuclear optical clock)). Such TOCs are required to compare distant optical clocks where no suitable fiber link exists. There are two other strategies for the comparison of clocks: satellite links for inter-continental comparisons, and transportable Cs clocks for same-continent comparisons, but both of these are too weak to fully exploit the accuracy of today’s best optical clocks. Transportable clocks would also be able to measure the geoid via the gravitational redshift, and they would do so with higher spatial resolution compared to satellite missions, and potentially with higher precision. The TOC presented by PTB is based on Sr-87 and operates very much like a standard laboratory-based Sr lattice clock. A few adaptations have been applied: the Zeeman slower is made of permanent magnets to reduce heat dissipation and power consumption by coils, and a total of eight temperature sensors have been placed near the atoms (both inside and outside the vacuum) to calculate BBR corrections. Following a general trend, the diode/TA laser system for the optical lattice has been replaced by a Ti:Sapph model to avoid ASE-related issues. The clock reaches a systematic uncertainty of 7 x 10^-17, limited by lattice Stark shifts (which have not yet been fully characterized) and cold collisions. The clock averages down as 1.3 x 10^-13 per root-tau, reaching an agreement with a stationary Sr clock in the 10^-17 range within about two minutes. These two parameters are about two orders of magnitude better than Cs microwave standards and make this TOC the best optical clock that actually left the laboratory. The transportable optical clock at PTB. 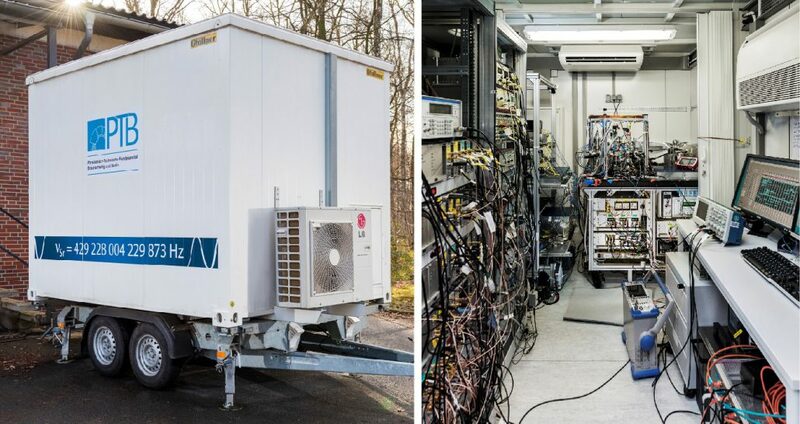 Left: the trailer that houses a miniature laboratory (2.2 by 3.0 by 2.2 meters), and right: the inside of the trailer. Both pictures taken from the publication arXiv:1609.06183. A short sidenote: it seems that the PTB team forgot to show that the clock actually is transportable… we miss that YouTube video showing the PTB trailer stuck in traffic. The publication is already available on the arXiv preprint server and has recently been accepted by Phys. Rev. Lett. for publication. Lars von der Wense, nuClock superhero of 2015, will face his PhD exam on Friday, Feb. 3. Although his chances of success appear rather small, we still wish him all the best 🙂 Good luck, Lars! A few days ago, a new manuscript was submitted to the arXiv preprint server. It discusses a new approach to measure (or at least contrain) the Th-229 isomer energy by optically exciting Th+ or Th2+ ions into metastable electronic states, and seeking to observe internal conversion from the excited electronic state to the nucleus. Laser excitation into a suitable metastable state seems to be an intricate process, involving 4 or even 6 resonant lasers. This publication is a joint work by the MPIK Heidelberg, Jyväskylä, and TU Vienna groups, and can be found here.